Welcome to our little corner of the blogging world. I am so happy you have come for a visit. I have linked up to the Boy Mom Blog Hop over at the MOB Society (Mothers of Boys). My name is Meaghan and along with my wonderful husband we have two boys (ages 2 and 4). I have a more detailed description about My Family here. This blog is a place for me to share about our lives, activities for children, crafts I make, and anything else that comes along. Check our the labels on the right side for different categories. In addition to being at home with the boys, I also work along side with my husband on our family business Integrity Fire and Control Systems Inc. My husband is the field technician and I am our office manager. If that doesn't keep me busy enough I am growing Meaghan's Home Daycare, and I sell my sewing projects at Me Again Creations. Praise the Lord that all of our endeavours and businesses are growing to support our family. Our plans sometimes change but we are trusting in the Lord's guidance. Our next family adventure will be homeschooling using a Waldorf curriculum! I looked back over all my posts and discovered that these have had the most page views of all times. Enjoy! He mostly likes puzzles and peek-a-boo. He does play a few computer games from TVO kids and other similar websites on occasion. He also likes those memory games where you flip 2 cards and try to find a match. I just started to teach him Tic-Tac-Toe this week and he sort of understands it. He loves this game called Eagle Eyes that we heard on at Sparkle Stories. It is just like Hide-And-Seek but the person who is it stays in one spot to look around for the other kids. Everyone else hides but has to be able to see the 'Eagle'. Last year the topic was books. I had prepared this post last week and realized this morning that the new topic was games. So I thought I'd include this anyways. My boys love to read. There are so many wonderful that they enjoy. Here are a few of our favourite authors and books. I'm not too sure on the appropriate ages so I'm guessing. I am so excited to offer a giveaway from Me Again Creations. I hope to start an Etsy store this year (perhaps some encouragement from you all will move me along faster). Please look at my store page on this blog for more details and come visit my Facebook page. Please 'like' my page when you come to visit. I am offering one lucky reader their very own boy Sock Monster!!! The winner will be able to choose one of the two monsters below. I will also personalize it with an embroidered name on the back if you would like. To enter please leave a comment below letting me know what your favourite item is in the shop (new or sold) or what new items you think I should add. Thank you again for visiting and happy hopping! Your sock monsters are so cute! Eventhough my mother is a fantastic seamstress, I can't sew anything! Great job! Wow, I'm tired just reading everything you do. I don't think I could do half. :) I did look at your stuff. It was very cute & creative. I liked the owl. Anyway, good luck with all your endeavors. lol so cute and funny! 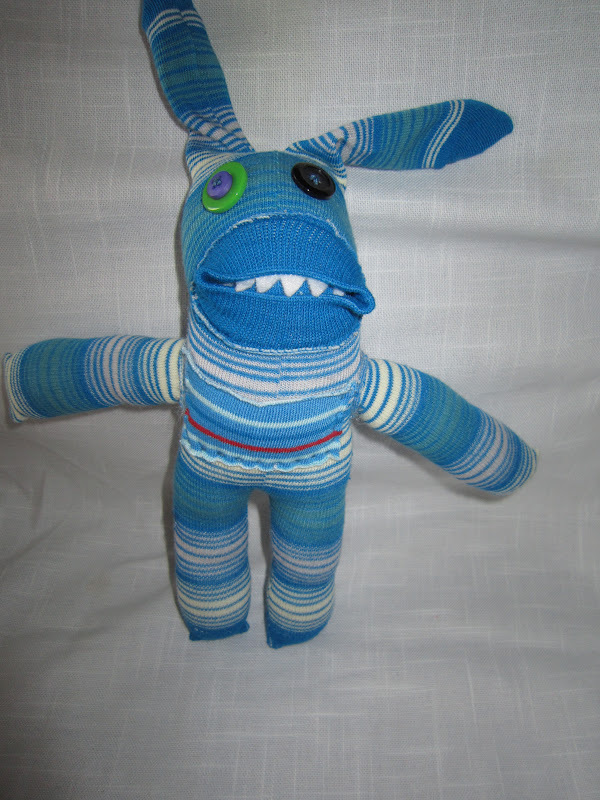 love the sock monsters! the octopus and owls are cute too! Your sock monsters are adorable, and I love how colorful they are! Here from the MOB blog hop. Just wanted to let you know your entry for the contest was on the wrong blog post :( I can't move it over, so you'll need to come comment on the giveaway post!! Sorry for the inconvenience!! What cute little monsters! My son would love it! Just bouncing over from the blog hop! Here from MOB. Sock monsters?! Just the name in itself will be a sure hit with my boys. Haha! But... my personal fave is that adorable owl! Those sock monsters are too cute. I need to show them to my son. :-) Here from the boy mom blog hop. Hi, I'm stopping by from the blog hop. You share some great info in your intro post. Your blog ground is really cute. Great to meet you on the blog hop! Sounds like you have a lot of creative ideas. Your boys are so cute. 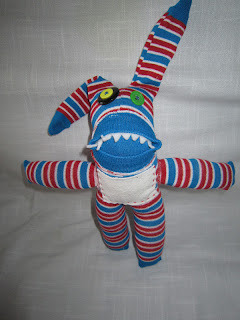 Meaghan's sock monsters are fantastic! I have bought several for my kids & gifts & they are a huge hit!! Cleaning with toys with boys! More summer activities for kids!